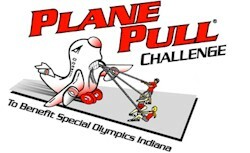 DIY - Plane Pull fundraiser! Lightest Combined Body Weight – team can compete again utilizing the lightest combined weight of team members who can pull the plane twelve feet within 3 minutes. A 727 may be a little more ambitious fundraising event than you are ready to undertake and may not be readily available. You could consider something a little smaller like a bus, fire truck, tractor trailer, earth mover, hearse, etc. – something that would attract interest and attention. Use your imagination! fundraiser for the school where the classes tried to pull the bus 100 feet. The PTO hopes to raise $5,000. Students will receive pledges for every foot they move a bus, from point A to point B. The teachers were able to pull the bus 100 feet in about 15 seconds.